att was one of the most industrious of men; and the story of his life proves, what all experience confirms, that it is not the man of the greatest natural vigour and capacity who achieves the highest results, but he who employs his powers with the greatest industry and the most carefully disciplined skill — the skill that comes by labour, application, and experience. Many men in his time knew far more than Watt, but none laboured so assiduously as he did to turn all that he did know to useful practical purposes. He was, above all things, most persevering in the pursuit of facts. He cultivated carefully that habit of active attention on which all the higher working qualities of the mind mainly depend. Indeed, Mr. Edgeworth entertained the opinion, that the difference of intellect in men depends more upon the early cultivation of this HABIT OF ATTENTION, than upon any great disparity between the powers of one individual and another. 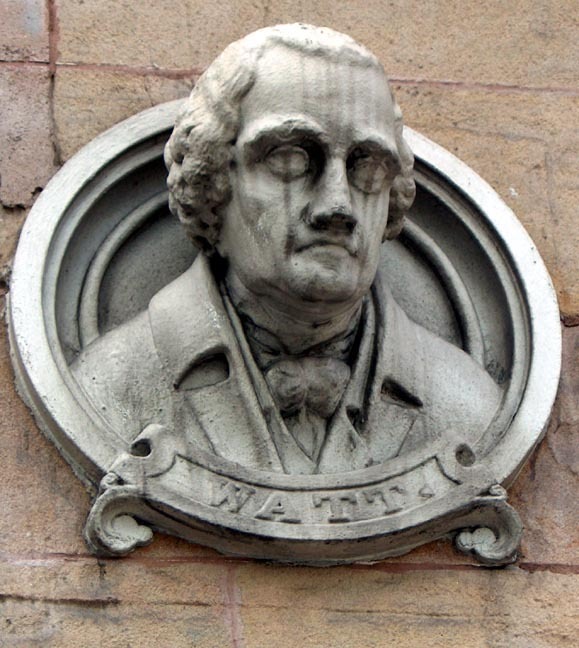 Two Victorian sculptures of Watt. Click on thumbnails for larger images. Even when a boy, Watt found science in his toys. The quadrants lying about his father's carpenter's shop led him to the study of optics and astronomy; his ill health induced him to pry into the secrets of physiology; and his solitary walks through the country attracted him to the study of botany and history. While carrying on the business of a mathematical-instrument maker, he received an order to build an organ; and, though without an ear for music, he undertook the study of harmonics, and successfully constructed the instrument. And, in like manner, when the little model of Newcomen's steam-engine, belonging to the University of Glasgow, was placed in his hands to repair, he forthwith set himself to learn all that was then known about heat, evaporation, and condensation, — at the same time plodding his way in mechanics and the science of construction, — the results of which he at length embodied in his condensing steam-engine. For ten years he went on contriving and inventing — with little hope to cheer him, and with few friends to encourage him. He went on, meanwhile, earning bread for his family by making and selling quadrants, making and mending fiddles, flutes, and musical instruments; measuring mason-work, surveying roads, superintending the construction of canals, or doing anything that turned up, and offered a prospect of honest gain. 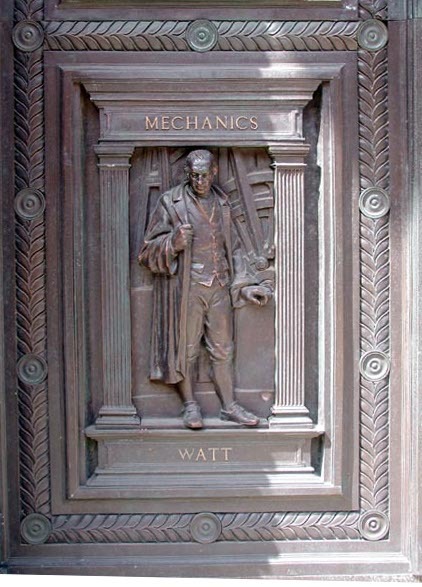 At length, Watt found a fit partner in another eminent leader of industry — Matthew Boulton, of Birmingham; a skilful, energetic, and far-seeing man, who vigorously undertook the enterprise of introducing the condensing- engine into general use as a working power; and the success of both is now matter of history. Many skilful inventors have from time to time added new power to the steam-engine; and, by numerous modifications, rendered it capable of being applied to nearly all the purposes of manufacture — driving machinery, impelling ships, grinding corn, printing books, stamping money, hammering, planing, and turning iron; in short, of performing every description of mechanical labour where power is required. One of the most useful modifications in the engine was that devised by Trevithick, and eventually perfected by George Stephenson and his son, in the form of the railway locomotive, by which social changes of immense importance have been brought about, of even greater consequence, considered in their results on human progress and civilization, than the condensing-engine of Watt. One of the first grand results of Watt's invention, — which placed an almost unlimited power at the command of the producing classes, — was the establishment of the cotton-manufacture. The person most closely identified with the foundation of this great branch of industry was unquestionably Sir Richard Arkwright, whose practical energy and sagacity were perhaps even more remarkable than his mechanical inventiveness. His originality as an inventor has indeed been called in question, like that of Watt and Stephenson. Arkwright probably stood in the same relation to the spinning- machine that Watt did to the steam-engine and Stephenson to the locomotive. He gathered together the scattered threads of ingenuity which already existed, and wove them, after his own design, into a new and original fabric. Though Lewis Paul, of Birmingham, patented the invention of spinning by rollers thirty years before Arkwright, the machines constructed by him were so imperfect in their details, that they could not be profitably worked, and the invention was practically a failure. Another obscure mechanic, a reed-maker of Leigh, named Thomas Highs, is also said to have invented the water-frame and spinning-jenny; but they, too, proved unsuccessful. When the demands of industry are found to press upon the resources of inventors, the same idea is usually found floating about in many minds; — such has been the case with the steam-engine, the safety- lamp, the electric telegraph, and other inventions. Many ingenious minds are found labouring in the throes of invention, until at length the master mind, the strong practical man, steps forward, and straightway delivers them of their idea, applies the principle successfully, and the thing is done. Then there is a loud outcry among all the smaller contrivers, who see themselves distanced in the race; and hence men such as Watt, Stephenson, and Arkwright, have usually to defend their reputation and their rights as practical and successful inventors.